Our team has used several types and brands of warmers over the years. When Scott at MOTO-D told me about his product, I could not help but be interested. Those of you who have been using warmers for any length of time understand that for some reason, they can be very fragile. I have, more than once, come out to my bike just before first call only to find a cold tire. The warmer had given up the fight at the worst possible time! One of the most saleable features of the MOTO-D Tire Warmers is the 2 Year “Burnout Proof” Warranty. Yes, a two (2) year no hassle warranty! On a set of warmers that retails for only $349 in the first place, this is unreal! There are other brands that cost twice the money and expect you to just buy new ones when they quit after a season. I also understand that a good warranty means nothing if the product doesn’t work. Well, I am here to tell you that the MOTO-D warmers perform well beyond what their affordable price may indicate to gear snobs. Running bikes that can tend to be on the low side of the grid’s horsepower numbers, I have worked hard on my starts. This means that I need to have tires that are up to temp for turn 1 without question. I need to be confident that my grip is there or my efforts at the green flag will be squandered by those who are braver than I on that first initial turn in. I found that not only do these warmers heat up the tires and wheels as needed, but they do it quickly. I was completely satisfied with the heat penetration of these warmers. The PRO-Series units are handcrafted in Europe and have a carbon weave exterior shell that provides extreme insulation. They also have Nomex lining that is thermally stable, provides insulation, and is flame retardant. The heat penetration and distribution provided by these materials was right on target. I ran 4 races that weekend and was able to hammer turn 1 with confidence each and every time. If you are looking for your first set of warmers or replacing a set with shorted wires or a faulty controller, these are the warmers you want! They are a great value and sport that two year warranty should something go wrong. They also have a PRO-Series Digital unit which has a slim backlit LCD controller for the ultimate control that retails for $449. 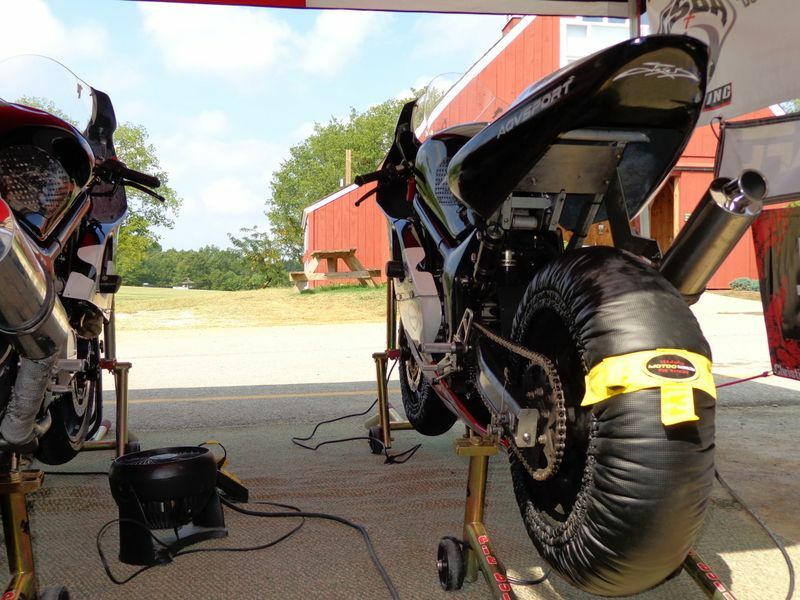 If you are a track day person and on a tight budget, MOTO-D has warmers for you too. Why waste track time, tires, and gas warming up your rubber? Or, worse yet, go into a turn too early and lowside your machine. I am willing to bet you will do more than $199 worth of damage to your bike and gear in that one crash. To prevent such disasters, MOTO-D offers entry level aluminized dual temp warmers for only $199! Better yet, they sport the same 2 year warranty! Not to insult anyone but, MOTO-D will even replace your warmers if you are a bone-head and burn them up from leaving them on! This will only happen once though so learn your lesson quickly! I will follow this up with a durability update once we have more time on them. I am also considering trying a set of the MOTO-D Digital Warmers so I have more temperature options available. You can purchase your next set of warmers at Performance Sportbike Motorcycle Accessory Manufacturer ? MOTO-D Racing . When you order, tell Scott that “Cowboy 6” sent you and he will hook you up with a discount on your purchase. Until next time, keep the rubber side down and leave nothing on the track but blackies! Nice, I saw Rick using these as well and started recommending them to people. Their prices are very affordable too. Been using these for a couple months and love them myself. I ran these for the first time down at VIR as well. Very pleased so far but want to use them 5-10 more times before i review. If you hold a race License mention that to them when you order. Scott is a good guy! 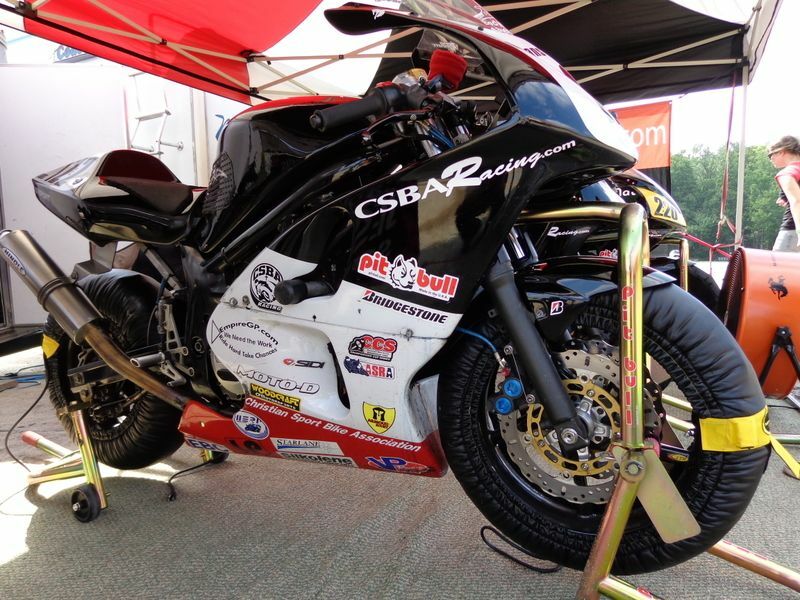 Actually, if you mention CSBA Racing, you will get a discount when you order! Thanks! I've got a set of the pro-series dual temps too and I've used them for maybe five track days now with great results. Scott was great with customer service during the buying process and stopped by and said hello when he saw me at the track. I have them and they work great. Fact is I have never heard anyone say anything bad about them. I think this has allot to do with the warranty. I have also heard great things about there one peace suits for under your leathers. I plan to pick up a pair here soon. Wonder where you heard that I love mine and will be getting another one soon since most of my trackdays are entire weekends or 3 days. MUCH better than the underarmour top and bottom I had been using. I've heard they don't get as hot as other more well-known warmers and they don't get hot as quickly either. I have not had experience with them so I'm only basing this on posts from another forum. I made one purchase from Scott and it went smoothly. They are a lower voltage than say Chicken Hawks. CH single temps get hotter faster for sure. One deceptive part about this is external heat (read as feeling the outside of the warmer) - the materials used on the MotoD ones dont allow them to be as hot to the touch outside. I will be bringing a temp gun to the next track event and do some true temp testing and timing. What you need is heat saturation through to and including the wheel. A hot surface temp is misleading. Also, the speed (while nice) is somewhat irrelevant unless you mess up on your timing. With cold tires, I run my warmers on high for one hour prior to leaving the pit. Does it matter if I would only need 55 minutes using brand A vs brand b? 65 minutes? No, you need to plan ahead and start the process accordingly. Besides, with red flags, delays and other unpredictable issues, there are times when the bike sits on the warmers too long anyway. What you want is a consistent, even, penetrating heat. MOTO-D warmers provide just that.